I had to have some pelmeni today. 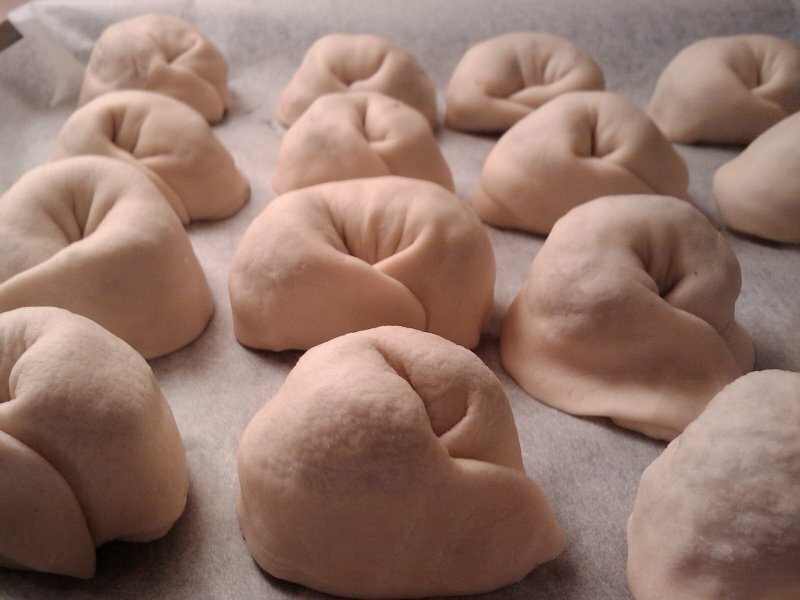 Luckily I remember learning how to make them when I was younger. 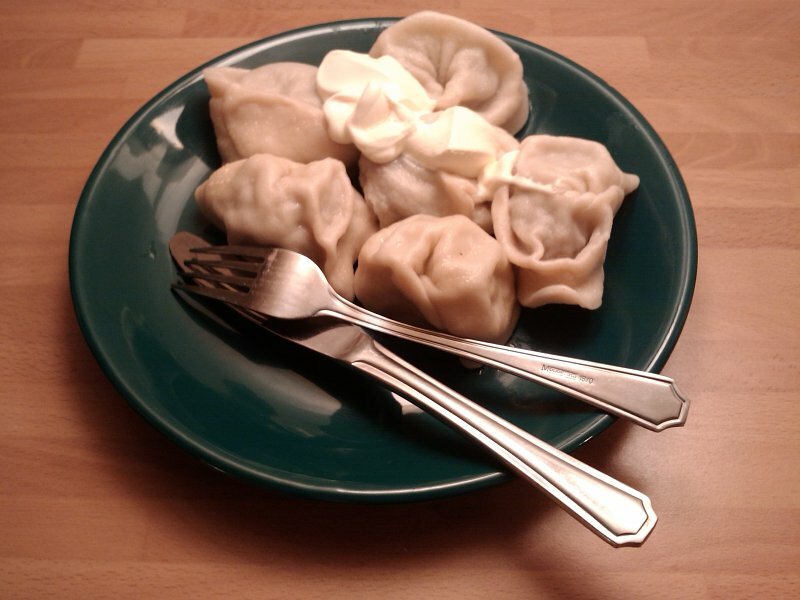 Pelmeni is a delightful culinary item from Russia. They are usually made in big batches and frozen in winter times. What you need for pelmenis is a kind of pasta dough and a filling. The filling can be basically any kind of meat, fish etc. I prepare mine with minced pork meat. Make sure you chop the onion finely. Finer the onion is chopped the better it will mix with the minced meat. Mix the ingredients of the filling well. I seasoned the filling with some thyme, cumin(geerah), hint of paprika, some cayenne pepper, white pepper, black pepper and salt. You can check the taste of the filling raw or you can fry a tiny bit of it on a pan to get a more accurate tasting. 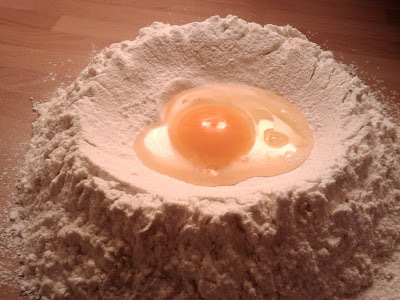 Prepare the dough as you would make pasta. You don't need to let the dough rest. 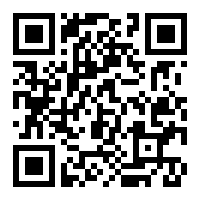 It's ready as soon as you're done punishing it. 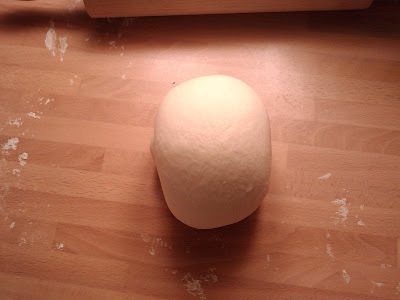 Knead the dough into submission. It will have better consistence that way and won't puncture easily. 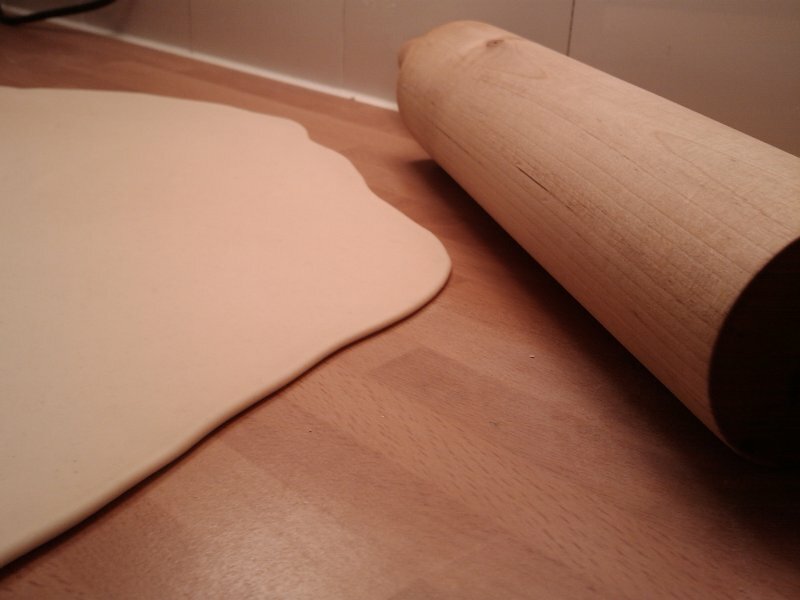 You can use a rolling pin to flatten and roll the dough over and over again. 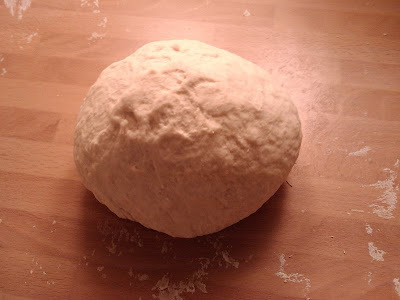 Flatten the dough as much as you can and make circles out of it. Turning it over from time to time and flattening it with a rolling pin allows you to get it thinner faster. Find something round you can use to cut the circles. I used the lid of my coffee maker. 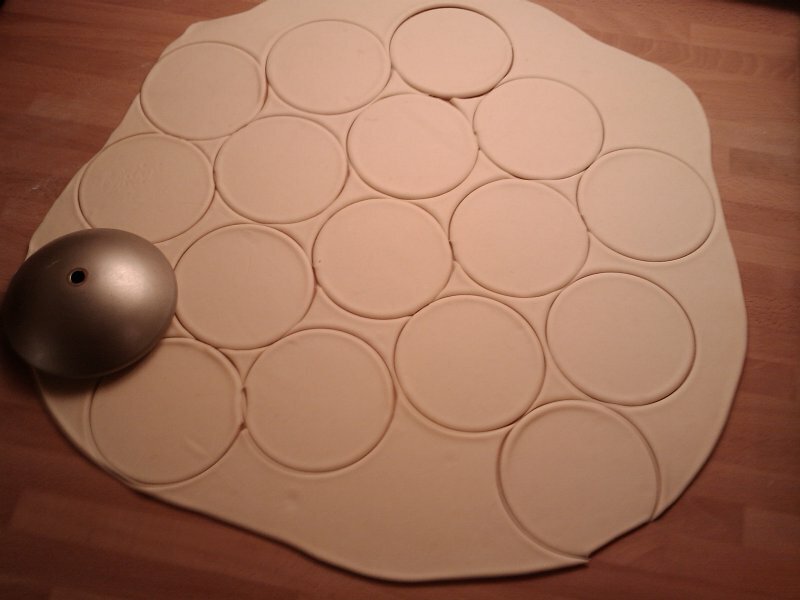 If the circles are too small you can use the rolling pin to make them larger. Stretching by hand(like you stretch pizza) works for me. 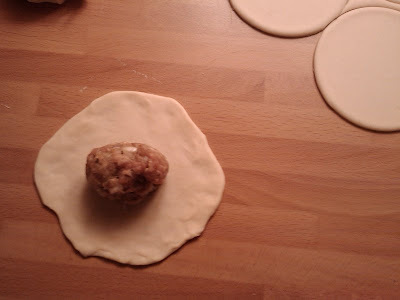 Take some of the seasoned meat and put it on the center of the circle that you have placed sticky side up. 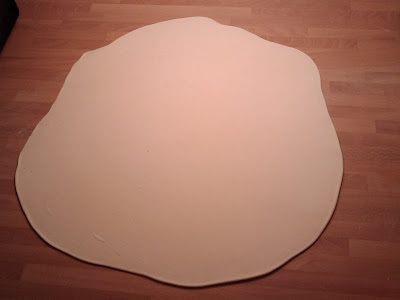 Fold and pinch to close and make a half circle with filling inside. Bend and pinch the opposite ends of the half circle together. 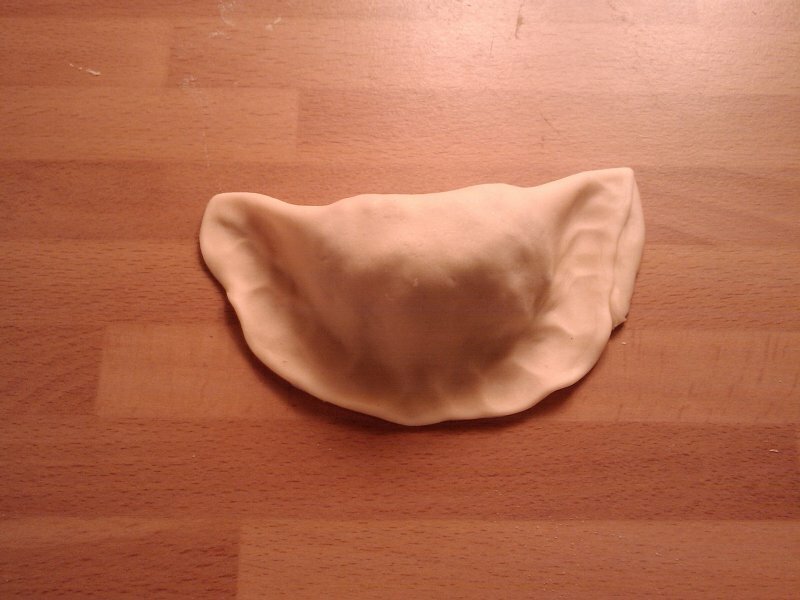 You can boil the leftover dough as thin strips to get a homemade pasta. I like to thwow it into the freezer and use it later. Boil in salted water. Raw pelmeni will sink to the bottom. They're about done when they float. 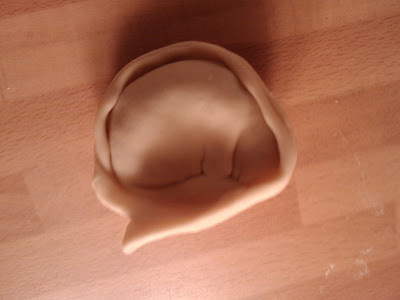 Bigger pelmenis might need a bit more time to boil even after they've started floating. Serve with smetana and freshly chopped chives or parsley.